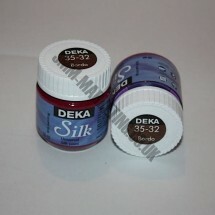 Deka Silk Paints 50ml	There are 20 products. 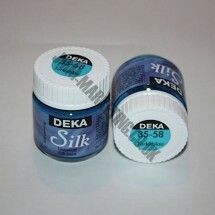 1 * Deka Silk Paint 50ml - Azure. Non toxic and water based. Can be used on synthetic fabrics. 1 * Deka Silk Paint 50ml - Black. Non toxic and water based. Can be used on synthetic fabrics. 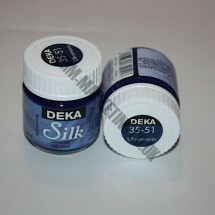 1 * Deka Silk Paint 50ml - Blue. Non toxic and water based. Can be used on synthetic fabrics. 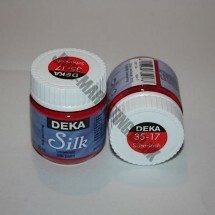 1 * Deka Silk Paint 50ml - Carmine. Non toxic and water based. Can be used on synthetic fabrics. 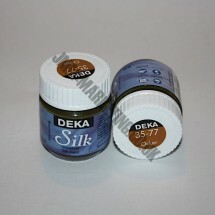 1 * Deka Silk Paint 50ml - Dark Brown. Non toxic and water based. Can be used on synthetic fabrics. 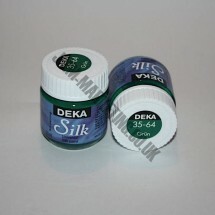 1 * Deka Silk Paint 50ml - Dark Green. Non toxic and water based. Can be used on synthetic fabrics. 1 * Deka Silk Paint 50ml - Golden Yellow. Non toxic and water based. Can be used on synthetic fabrics. 1 * Deka Silk Paint 50ml - Green. Non toxic and water based. Can be used on synthetic fabrics. 1 * Deka Silk Paint 50ml - Lemon. Non toxic and water based. Can be used on synthetic fabrics. 1 * Deka Silk Paint 50ml - Light Green. Non toxic and water based. Can be used on synthetic fabrics. 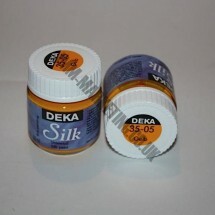 1 * Deka Silk Paint 50ml - Ochre. Non toxic and water based. Can be used on synthetic fabrics. 1 * Deka Silk Paint 50ml - Orange. Non toxic and water based. Can be used on synthetic fabrics. 1 * Deka Silk Paint 50ml - Pink. Non toxic and water based. Can be used on synthetic fabrics. 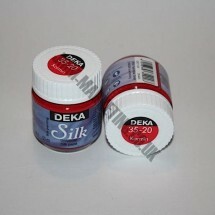 1 * Deka Silk Paint 50ml - Scarlet. Non toxic and water based. Can be used on synthetic fabrics. 1 * Deka Silk Paint 50ml - Sienna. Non toxic and water based. Can be used on synthetic fabrics. 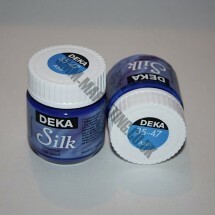 1 * Deka Silk Paint 50ml - Turquoise. Non toxic and water based. Can be used on synthetic fabrics. 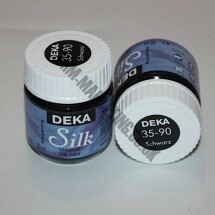 1 * Deka Silk Paint 50ml - Ultramarine. Non toxic and water based. Can be used on synthetic fabrics. 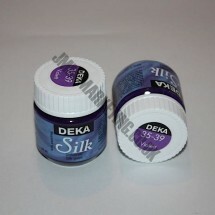 1 * Deka Silk Paint 50ml - Violet. Non toxic and water based. Can be used on synthetic fabrics. 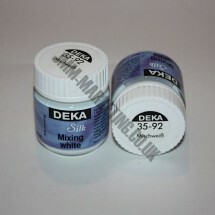 1 * Deka Silk Paint 50ml - White Extender for pastel shades. Non toxic and water based. Can be used on synthetic fabrics. 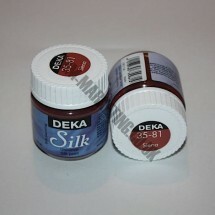 1 * Deka Silk Paint 50ml - Wine Red. Non toxic and water based. Can be used on synthetic fabrics.